The MoS is the only Tory newspaper not to have endorsed David Cameron but they come close to doing so today in a leading article (not online) entitled "At last, a Tory who is capable of turning the tide". "After eight years of circling hopelessly in the wilderness, the Conservative Party seems at last to have found a direction which may take it back to power... We do not really know very much about Mr Cameron except that he is new. Many of his ideas seem vaguely Leftish... But to many his detailed plans matter a great deal less than the fact that he is not Mr Blair, and his party is not New Labour." The MoS believes that we could be close to one of those rare turning points in British politics "when the government is weary, and when a fresh generation is growing ready to take over." It pinpoints 1964's election of Harold Wilson - replacing "the dreary staleness of the Tory cabinet". The 1979 Thatcher victory. And, of course, the dawn of New Labour in 1997. Turn over the page, however, and MoS columnist Peter Hitchens sees David Cameron as more of a continuity man - rather than a turning point. Hitchens, author of The Abolition of Britain, argues that from 1970 to 1974 and from 1979 to 1997 the Tory governments only made "a few misleading noises" about reversing the socially revolutionary Labour policies of the 1960s. "Marriage was not defended," he says, "grammar schools were not reopened, the anti-family welfare state was not slowed and crime was not fought. The EU's tentacles were allowed to wriggle into every corner of our lives". "So Mr Cameron, slashing away any last signs of conservatism, will turn his party into a middle-class, Southern versiuon of New Labour... The task of creating a real Opposition is put off once again, perhaps until it is too late." As much as I hate the reactionary tendancies of Peter Hitchens, I must say he's right on Cameron and the failure of the party to stand up for decent values in past years. About 30 mins ago I was going to make a comment about this on the Independent article in the Commentators section. I think Peter Hitchens tends to make some very good points. He is not always correct in my opinion but makes some good points. His comment on cannabis "the drug that David Cameron wanted downgraded, the drug that our liberal elite thinks is a bit of giggly, harmless fun" rang particularly true. We have to remember however that Peter Hitchens never endorses the Conservative Party, which he wants to see fade away and die, so that a new political party built in his own image could be created. 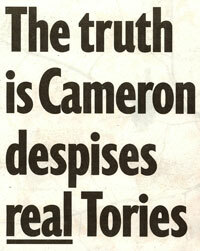 I do wonder though who these "real tories" he refers to are? Certainly not him, being a former Trotskiest lunatic. I agree with a lot of what Peter Hitchens says about the Conservative party. At times I find myself wondering if indeed the party is beyond redemption. I just wish Hitchens could provide a way forward for those who share his views. Oh dear. When will somebody remove Peter Hitchens from his time warp and drag him into the 21st century (with a fleeting visit to the 20th century for good measure)? Richard- quite agree...Hitchens seems to epitomise the rant school of right-wing politics. Many of us agree with some of what he says, but we are all quite capable of depressing ourselves. What we'd like from people like him are some possible solutions...not just "we're all F****D". Hear hear DVA.Peter Hitchens regularly buries the good points he sometimes makes in a plethora of bile about modern Britain and its politicians which make him a figure of fun amongst his colleagues and irrelevant to the needs of the modern Conservative Party. "What we'd like from people like him are some possible solutions...not just "we're all F****D"." Actually, I think he does offer solutions. But no-one ever listens to them. Such doom and gloom predicitons are very depressing. While I could agree with some of the things he says; he hasn't got to get elected, which is just as well, because people don't vote for a negative campaign. We need an optimistic message offering solutions. Let's give DC a chance to lead us back into government it's the only chance we've got! At last, something Daniel Vince-Archer and I can agree on! Extraordinary. Agreed Malcolm - the man is so out-of-touch I imagine he considers Enid Blyton to have been a peddler of filth as well as a dangerous liberal firebrand and I imagine he would consider her work to be the ravings of a demented lefty lunatic! "Let's give DC a chance to lead us back into government it's the only chance we've got!" Sounds like a wail of desperation to me. "At last, something Daniel Vince-Archer and I can agree on! Extraordinary." I find it sad that Christopher Hitchens won't be able to enjoy the renewal of the Conservative Party that is about to take place. Personally if Cameron wins I will be thrilled. At last a Conservative leader who has a positive message. At last a leader who can speak to my generation and be heard. I know that Hitchens et al are concerned that he isn't Tory enough. It's not true - the difference is his politics have been shaped in the 80's and 90's, not the 60's and 70's. The slight differences in emphasis and tone which seem to freak Hitchens out are the differences that will make him the success he is going to be. I think you mean Peter, not Christopher, Free Democrat! Peter Hichins is the worst kind of Mail on Sunday columnist. He isn't a Conservative supporter and his sneering nicknames for people "Princess Tony or the Useless Conservatives" show him up to be a man with little or no real political depth. I love political debate and when Hitchens grows up I may take note of what he has to say. "from 1970 to 1974 and from 1979 to 1997 the Tory governments only made "a few misleading noises" about reversing the socially revolutionary Labour policies of the 1960s." "Why should we listen to anyone who discredit's the greatest Conservative government of all time..."
It is a failing many Thatcherites acknowledge. Lord Tebbit, for example, has been open in saying that he thinks the Thatcher governments concentrated on economics at the expense of social policy and should have made that theme of the '87 manifesto. "Lord Tebbit, for example, has been open in saying that he thinks the Thatcher governments concentrated on economics at the expense of social policy". And even Margaret Thatcher herself has expressed regret that over just that. I think much of what Peter Hitchens says is true. The Conservatives *did* give away powers to Europe. It is a mistake I now hope they recognise. Nevertheless, it was a big error of that period. Conservatives have also been far too timid in even entering into a debate on the "culture war" which the socialists have waged against us in a Gramscian fashion. The result of this is that our opponents have been able to frame the debate and portray us as bigots. The more we shy away from even discussing the subject, the more entrenched that view becomes. The Tories had almost 2 decades in power, and in that time they achieved much; but there was also a great deal they neglected to do (for whatever reasons). And we still suffer for it. Reform of the welfare state is another good example (not to mention the NHS). Peter Hitchens should go off and join the BNP. It is people like him that does a great deal of damage to our Party. His policies would not wins us any elections. "Peter Hitchens should go off and join the BNP." Why would he want to team up with racist socialists? Nelson, Norfolk: That was an unworthy comment. I do not believe there is anything racist about Peter Hitchens. Sorry but I'm banning your IP address for a week for that suggestion. I can't have such stuff thrown around. Hitchens is not a Conservative and has never been a Conservative. My housemates at University - none of them overly political - used to buy the Mail on Sunday simply to laugh at his sheer ludicrousness. He is a self-publicist with very little to offer the Conservative Party. "My housemates at University - none of them overly political - used to buy the Mail on Sunday simply to laugh at his sheer ludicrousness"
Its reassuring that occasionally a story like this emerges bringing us all together after this divisive leadership contest. Cllr Lindley, my university housemates did exactly the same! We even had a quote of the week from the hatter. Malcolm is totally right that its a pity Hitchens buries his sound points beneath so much winging bile. I totally agree with him on the EU and his rousing defence of Nozickian Libertarianism. However, its his crusade to return Britain to victorian morals that will ultimately always leaves him outside the Conservative tent. Though most will agree that morals have strayed, he really does take it all uncomprimisingly far. Well I don’t think any answers are given to Peter Hitchen's criticisms and most seem determined to have an argument with the person they want to believe he is, rather than with the arguments he presents. And on the contrary, most Tory die-hards, especially Cameron supporters, are living in a time warp, laughably deluding themselves that a principle free careerist (or anyone else) will lead them to victory. I suspect any manifesto drawn up by someone like Hitchens, even after compromises, would have far more appeal amongst vast numbers of the disenfranchised working class votes, who will never vote Tory no matter who is leading you. As the article which annoys and hurts you so much stated "The irony is that it will do him and his friends no good because the Liberal Democrats already have the franchise for this operation. And they appeal to voters under 35 who view the Tories as a peculiar survival, like pipe smokers and women who wear twinsets. Anyone who saw Hitchens' tragically ill-informed programme about the EU last week will know that he has now abandonned facts in favour of his own theories and fantasies. As it happens, Mr Cameron is in favour of supporting marriage. So why isn't Hitchens supporting him? For the same reason that he didn't support IDS (although he did support Hague, because he'd read his book) and opposed the liberation of Iraq! Because he attacked both Bush and IDS as "weaklings", and then couldn't go back on what he'd written! He may be right that the Tories cannot ever return to government, and so far there's very little sign that they're taking their dire situation very seriously. (The idea that they can get back into power just by having a nice-looking leader is real nursery-school politics.) But it's worth remembering that Hitchens' main aim is to justify his own positions (and of course to oppose all his brother's -- and hence yet more cause for his support of Saddam).